The 4SCU20LX variable-capacity air conditioner is the perfect example of Armstrong Air’s commitment to providing you with maximum control of your home temperatures, energy use and air quality. With its ability to adjust cooling output with extreme performance and precision, the 4SCU20LX can keep your home exactly how you want it from summer to summer. 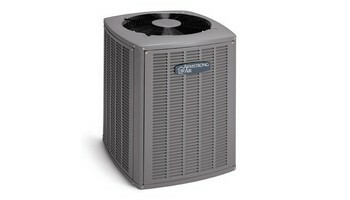 All while using up to 50% less energy than a standard air conditioner. *Armstrong Air’s proprietary heat transfer system uses a specially designed fan shroud, rifled tubing and lanced coil fins for maximum heat transfer and efficiency ,A swept-wing fan blade design reduces turbulence, while a heavy-duty compressor blanket further reduces sound levels.High- and low-pressure switches prevent the compressor from turning on if there is too much or too little refrigerant, helping to ensure lasting performance Inverter-Driven Scroll Compressor: Rather than running at one or even two speeds, the scroll compressor in the 4SCU20LX uses an inverter motor that can change its speed in small, precise increments. This lets the 4SCU20LX use just the right amount of energy, while holding your temperature precisely where you set it.Your Armstrong Air 4SCU20LX continuously monitors internal components for optimum performance and fault prevention, and notifies you and your dealer if repairs or maintenance are needed. Pair this model with a Pro Series™ variable speed furnace and a Comfort Sync thermostat, for optimum performance. With the Pro Series, you’re in control of every aspect of your home’s climate, as well as your energy cost,When you pair this model with the Comfort Sync thermostat, the system will continuously monitor internal components for optimum performance. Comfort Sync puts you in total control of your home environment with remote temperature adjustment from anywhere in the world, even your couch, via smartphone app. When Comfort Sync detects that repairs and regular maintenance are needed, it alerts you or your dealer instantly, so your perfect environment never ends. Rather than running at one or even two speeds, the 20LX Inverter-Driven Scroll Compressor changes its speed in small, precise increments and adjust cooling up and down like a dimmer switch. So temperatures are held exactly where you want them, even in extremely hot weather.Integrated Compressor Protection: The combination of both high and low pressure switches give additional reliability to each Armstrong Air cooling unit. The high pressure switch prevents operation in the event that refrigerant pressures exceed safe levels, protecting the compressor. In the event that your unit does not have enough refrigerant, the low pressure switch prevents the unit from drawing in moisture and other contaminants while operating.Armstrong Air’s proprietary heat transfer system. The coil features rifled tubing to enhance refrigerant flow, while lanced coil fins increase surface contact between metal and air. They combine for maximum heat transfer and efficiency.